NUS biologists have developed cyclic peptides that can trigger cancer cell death without affecting healthy cells. The glucose-regulated protein 78 kDa (known as GRP78) is emerging as a target for cancer therapy and a biomarker for cancer prognosis. It is usually produced in greater quantities in cells that are under stress conditions. 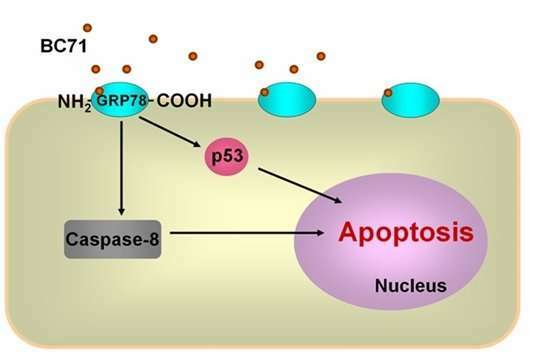 In many types of cancers, GRP78 protein has been observed to be produced in abnormally large quantities and it tends to be found on the cell surface of cancer cells and cancer blood vessel endothelial cells. A research team led by Prof GE Ruowen, Department of Biological Sciences, NUS has developed a cyclic peptide named BC71 which is able to effectively suppress tumour growth in murine models when delivered intravenously. BC71 peptide selectively accumulates in cancer, attaching itself onto the GRP78 protein present on the surface of cancer cells as well as cancer blood vessel endothelial cells, triggering cell death in the process. In healthy cells, GRP78 protein is only present inside the cells and cannot be reached by BC71 peptide. However, in cancer cells and cancer blood vessel endothelial cells, there is a large amount of the GRP78 protein located on the cell surface. Higher GRP78 protein levels in cancer typically correlate with poor prognosis and higher likelihood of drug resistance, with features of aggressive growth and high metastatic rate. As BC71 selectively targets cell-surface GRP78 proteins, this peptide can potentially be useful for these types of difficult to treat cancers. Prof Ge said, "BC71 is small cyclic peptide with molecular weight of about 600 daltons. With further chemical modifications, it could be developed into more effective drug compounds with enhanced binding affinity to GRP78 protein and augmented death-inducing potency in cancer cells." "In addition, radioisotope labelled BC71 have the potential to be used as a probe in positron emission tomography (PET) imaging to determine how aggressive a cancer is in prognosis assessment," added Prof Ge.